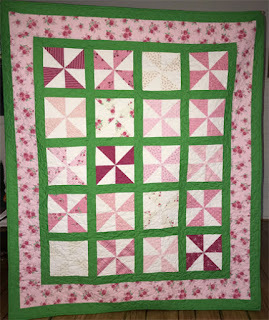 Quilt 105: Half-Square Triangles - Moda "Quilt Pink" - DONE! It came together SO FAST! And I love the bright cheery colours. The charm squares were purchased for this quilt. 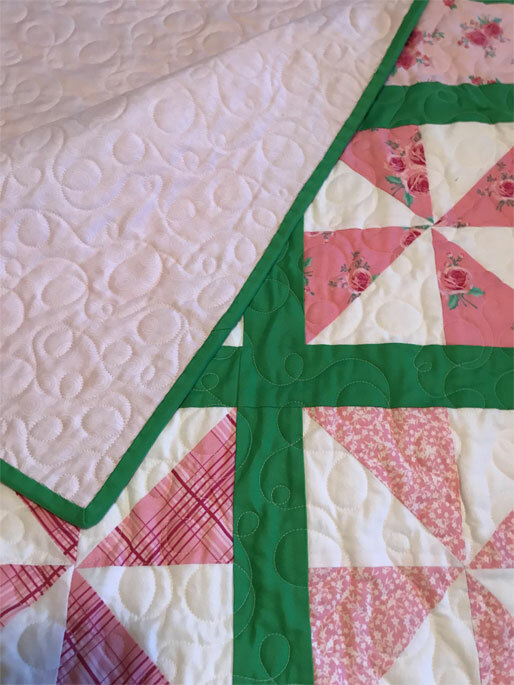 The rest of the fabric in the top is leftovers from other quilts. 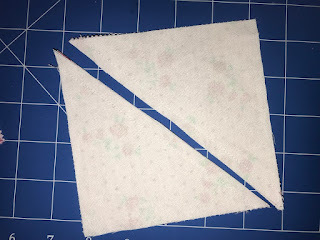 The backing fabric is a soft pink print (little flowers in 2 shades - very subtle). I got it at the big sale I told you about a couple of weeks back. I'm working on using up my cotton batting, and am switching now to bamboo batting. The bamboo costs just a little bit more, but it produces so much less lint when I'm quilting that it's worth the extra money. 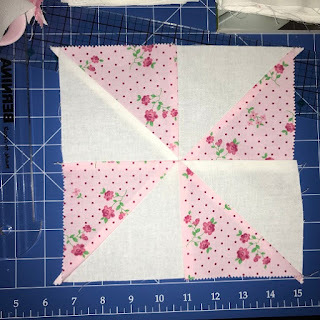 Quilt 105: Half-Square Triangles - Moda "Quilt Pink"
After watching some Missouri Quilts YouTube videos (starring the fabulous Jenny), I decided to grab a pack of charm squares and try my hand at half-square triangle blocks. 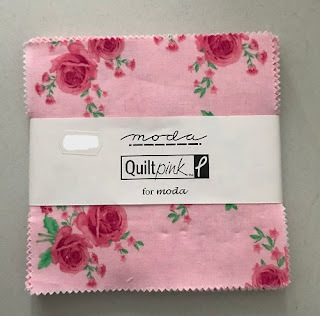 I used Moda's "Quilt pink" pack - and got 2 packs of this set, because the "pinwheel" blocks I want will need 2 charm squares (and this set from Moda doesn't have any repeating prints - every print in the pack is different). And I cut out an equal number of white 5" squares from some leftover fabric I had. Then I placed one of the prints and one solid white square together (right sides in) and drew diagonal line from one corner to the other. 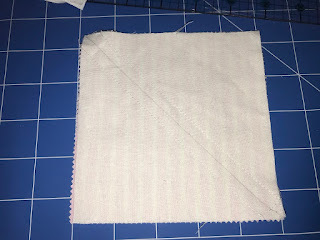 I stitched 1/4" out on either side of the pencil line. And here's the finished block. I've got a bright green solid fabric (leftovers from another quilt), and will frame my blocks in a 2" lattice. I'll have that to show you next week! 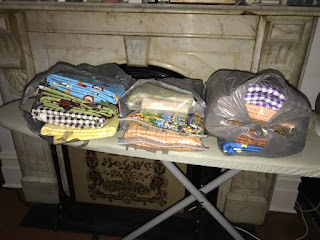 I thought about giving this post the title of "It's Not What You Spent, It's What You Saved" - but I know I've used that before, although some years ago. I went. To make matters worse, I contacted Pauline, my quilting guru and she didn't exactly say "...lead me not into temptation". No. Pauline was all too happy to join me in a fabric frenzy. And yes, readers, that is exactly what happened. I broke a new record for yardage bought on a single shopping trip. It's actually enough that I couldn't carry it all - had to make 2 trips to/from the car to get it into the house. Now I'll partially redeem myself by saying that when I buy fabric for a new quilt, I almost never buy the backing at the same time. So I've got several projects in the pipeline which will need backing, and I was going to have to make a special trip to get it. But here I was - with Gail's unimaginably inexpensive 4-meters-for-$20 - AND quite a few of the packs she had are just about perfect backing for top fabric I already have. So yes... indeed... I did save a lot. Devil: Look at those 4-meter packs! What a deal! Me: No, I'm not buying anything. Oh - wait! I have a top ready to sandwich and this pack is perfect! Devil: See? Would I lie to ya, baby? Me: Right. 2 packs of backing and here's a kit marked down super low. I made one of these a long time ago. It was fun doing it and the results are stunning. This would be lovely for one of the "Inspirational Quilts" kids. Devil: Charity begins at home. Me: Well, I'll get some thread while I'm here. Me: Ah yes - a spool of this and a spool of that. Devil: get 2 each. 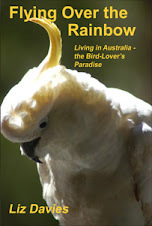 That way you can use one for the machine head, one for the bobbin! Me: There's some sense in that. Devil: Oh look! Charm Squares! Me: Oh look! 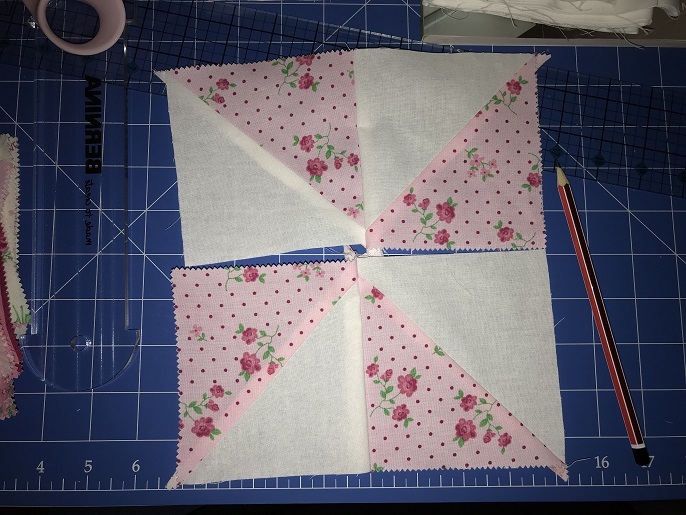 Charm Squares!